If your a Porsche owner, chances are you're all to familiar with the problem. You toss a few weekend bags in the luggage well for a trip to the country only to find later that your cargo has left a permanent impression on the underside of the car's lid. 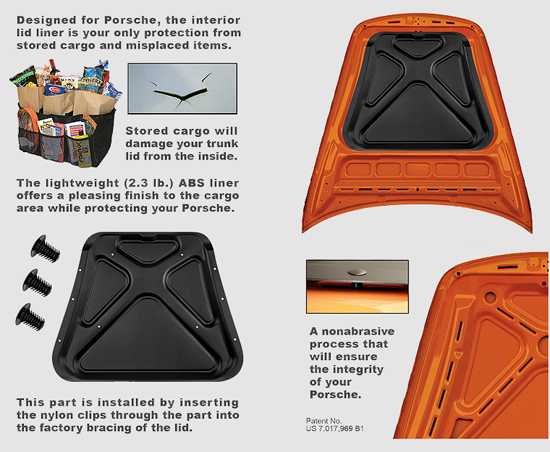 This is the first and only liner custom designed for the Porsche lid. Prevents dings in your lid and dents in your wallet. Lightweight and color-coordinated to blend in, this hood liner is also easy to install. Simply use the included clips to snap the shield into the factory bracing and go. No tools needed means no hassle. Not a factory part, but of factory quality. Comes with the front hood liner, and optional rear liner for Boxster models. Note: Additional weight may require strut replacement on older models. Looks fantastic, looks like it should have come with this from the factory. Now I don't have to worry when my wife loads the car with groceries.